Understand the varieties of tile you can pick bathroom tile from. Make sure you do your research and look up the following types of tile: ceramic tile, glass tile, mosaic tile, porcelain tile, natural stone tile (marble, slate, granite, etc). This does not complete the bathroom tile list, as there are many more. Glazed ceramic tile is often used in bathrooms because it is water resistant and less expensive than other tile, but be sure to research sealants for other types of tile too. Natural stone can be a beautiful solution for your bathroom as long as you are ok with spending the extra money to seal it and make it work. You don’t have to stick with one material throughout your bathroom either. Mix stone with porcelain, or ceramic with glass. There is no right and wrong when defining style. Now that you have an idea of all the different types of tile, we can go over what colors and pattern options there are. We all know that dark colors make a room feel smaller, so when picking tile colors choose a color that suits the bathroom size. 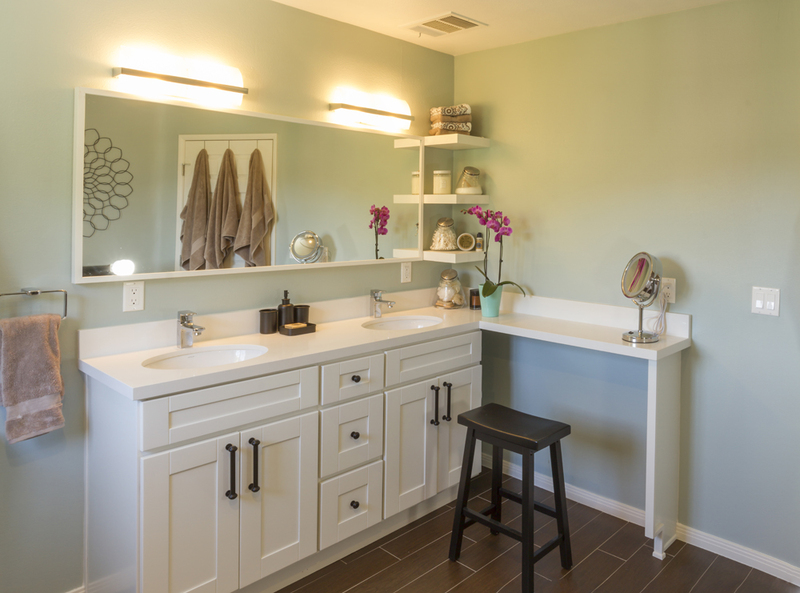 Pops of color or contrasting colors are great for bathroom tile projects. I love the look of our bathroom remodel; we went with a few different patterns and color options to create this custom look. You do not have to pick all one color tiles to achieve a sophisticated look. Tip: Choose colors that complement each other or draw from the other tile. Such as the brown boarder tiles and accent pattern drew from the dark colors in the granite tub top and counter top. If you have a small bathroom and you want to trick the eye into thinking it is bigger, you can opt for one or two light colors from floor to ceiling. This will give the room no sharp edges and an endless look. Small or large, there are plenty of tile colors and options to suit every style and budget. For project assistance or remodeling needs, Contact Spazio LA today. Dream- Design- Build.